Spiro Voice allows you to make and receive calls and texts from your dedicated Spiro Voice number on the web and mobile app (iOS). The best part: Activity will be automatically be logged in Spiro! In Spiro, navigate to the left side toolbar and click into Settings > Spiro Voice. You can also set up call recording under settings. Files for recorded calls will be saved in the contact's timeline. 1. Navigate to a contact you want to call. 2. Click the phone or SMS action buttons on the top right of the screen. During a call, a user can take notes and then when they hang up -- and log activity -- the notes are automatically recorded in Spiro in the timeline. 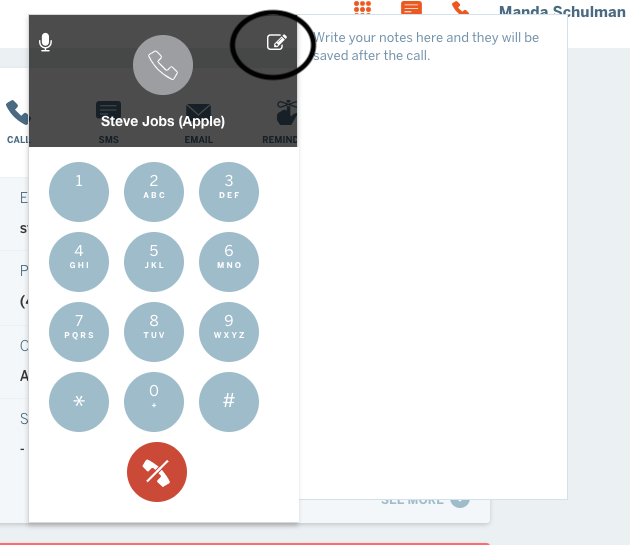 To view the message center, manually dial a phone number or view call logs, navigate to the Spiro Voice toolbar in the top right corner of the page. Click the dial pad icon to manually dial a number. Click the middle text icon to view your text message history and send new messages. Click the “Phone” icon to view your call history.